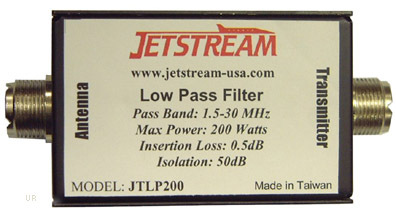 The Jetstream JTLP200 Low Pass TVI Filter plugs between your transmitter and antenna or tuner. It will reduce transmitter harmonics by 50 dB! Harmonics can cause interference to nearby TVs, radios, VCRs, DVD players, telephones, etc. Passband is 1.5 to 30 MHz into 50 Ohms. It can handle up to 200 Watts with only 0.5 dB insertion loss. Isolation is 50 dB. SO-239 connectors. Required coaxial jumper cable is not included. Copyright 2010-2018 Universal Radio, Inc.